After a much needed night’s sleep, we lounged around for a while trying to decide what we were going to do that Saturday. Originally, we thought we might do a mini wine tasting trip to Napa or Sonoma, but we didn’t want to sit in the car for 2-3 hours total and decided instead to find a farmer’s market where we could browse and get some lunch. Unfortunately, the only one we could find was the tiniest farmer’s market we’d ever seen. There were about 6 booths and the only prepared food was kettle corn. It was extremely disappointing. Instead of just going back to the house and sitting around until dinner, we decided to find a mall where we could walk around and eat lunch. We found one and browsed The Container Store, Crate and Barrel, REI, and Barnes and Noble. Then, we ate at The Counter, which was new to my husband. I think I’ve been spoiled with Umami Burger because I’m just never that impressed with The Counter. My burger always falls apart and I’m not that good at coming up with the perfect combination. Umami has smaller portions and they know how to build the perfect flavor combinations (have you had the hatch? it’ll change your life). Once our bellies were full, we headed home to take a nap. Yes, I took another nap on this trip and it won’t be my last, so get over it. After our nap, we got ready to head to Sausalito for a massage and dinner with friends. We got massages at Massage Envy which is a nationwide chain that isn’t really a spa, but it’s nicer than a tiny massage parlor. We went there because they had a deal for first time clients for $49 for an hour massage. We would have been happy with one of those Chinese foot massage places they have out here in LA, but it seems the suburbs of San Francisco haven’t discovered the pleasures of super cheap sitting massages. They have a couple places in the city, but that wasn’t an option this day. Our massages were pretty good, but not fantastic. I’d say they were worth the fifty bucks, but I probably won’t go back there. For dinner, we headed to Sushi Ran. We met up with my husband’s friend who he used to work with and his wife. His friend now works at Alcatraz and offered to give us a behind-the-scenes tour when we went on Sunday, so come back Thursday to read about that awesomeness. While we were waiting for our friends to arrive, we noticed this cute little setup outside the restaurant. 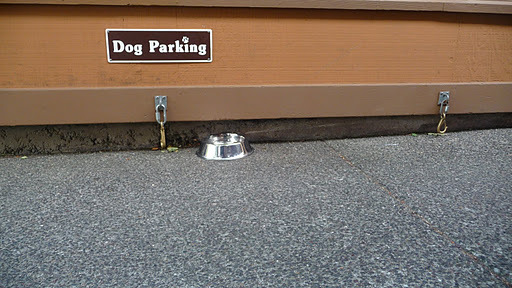 Our dogs would never behave, but it’s a nice idea. The sushi was great, but we weren’t that impressed with the rolls. I know that rolls aren’t real sushi – the best places don’t even offer a selection of rolls, maybe just spicy tuna – but for such a pricey place we were expecting a bit more out of the roll selection. Oh, also, the sushi was priced per piece (not the rolls, just the sushi and sashimi). So if you wanted two pieces of salmon sushi, you had to ask for two orders. See how that can add up? 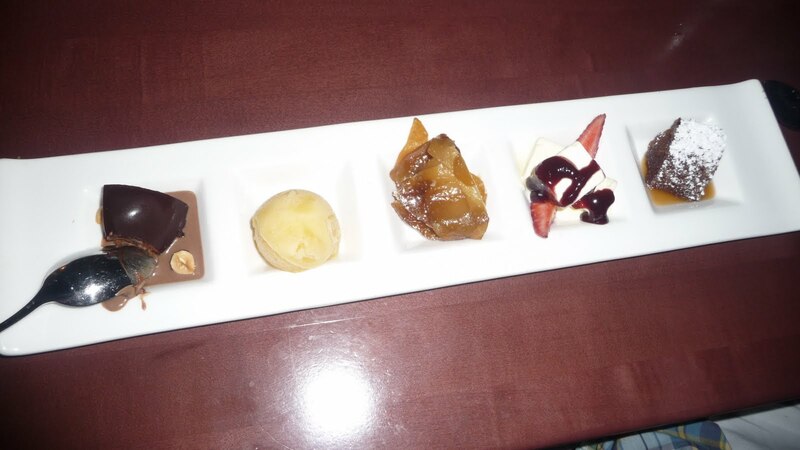 We got the sampler platter for dessert and everything was delicious. Our favorite was the warm toffee cake. It was to die for! 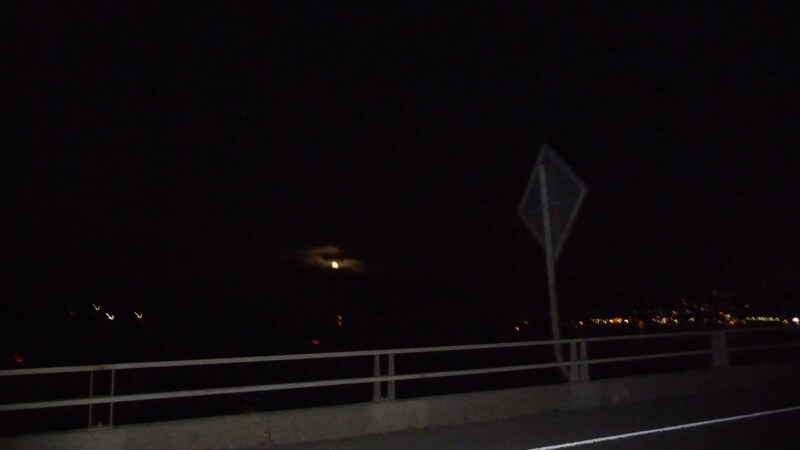 My husband tried to get a good shot of the pretty moon, but didn’t really do so well. This was the best he could do. It was a lovely Saturday filled with my favorite things: shopping, burgers, naps, massages, and sushi! I wish every day could be like that. What would you do and eat on your perfect day? For Thursday, our last day in San Francisco: Alcatraz and more yummy food. I've never tried Umami Burger, but I do love the Counter. So yum! I always do a veggie with bbq sauce, grilled & fried onions, and cheddar. Wow, my mouth is watering now. On my perfect day, I'd wake-up, go to breakfast with the family and sit outdoors while sipping coffee and eat a belgain waffle. Yum. My perfect day would be to start out getting a coffee with Adam, packing a lunch and going to the river by our house then coming home to make dinner – cayenne chicken with avocado (thats my fav lately). LA has sushi that is EONS better than stuff you can find up here! I practically have to drag my husband out to eat sushi (I have very low standards—I'll eat it every day from the grocery store if I have to! 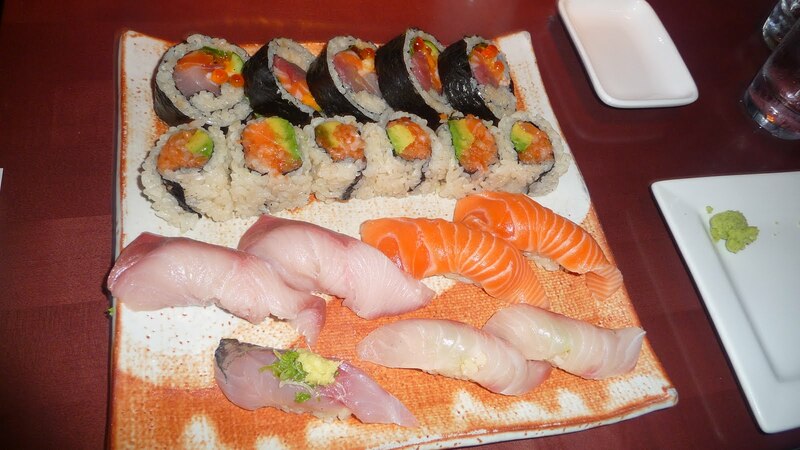 ), and his are higher, so we splurge and go to Sushi Ran when I can drag him there. 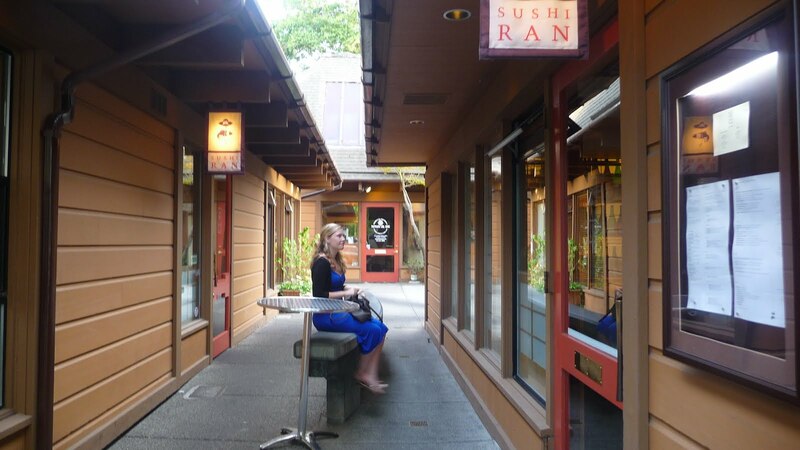 I really like it there, but it's EXPENSIVE and sadly, the best thing you can find around (some really great places in SF but if you think Sushi Ran is expensive, then FORGET IT! Ugh.). Not sure why SF is just not a sushi haven, but it isn't!I've never been to the burger place you mentioned that you went to but YUM, I do LOVE Umami too!